O God, who restore human nature to yet greater dignity than at its beginnings, look upon the amazing mystery of your loving kindness, and in those you have chosen to make new through the wonder of rebirth may you preserve the gifts of your enduring grace and blessing. Through our Lord Jesus Christ, your Son, who lives and reigns with you in the unity of the Holy Spirit, one God, for ever and ever. 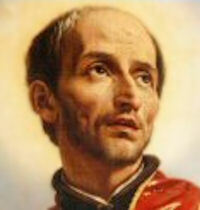 Historically today is the feast of St. Francis di Girolamo, a Jesuit priest from Italy who spent most of his life working as a rural missionary in the countryside near Naples. His sermons were short and vigorous, and he touched many hearts. According to the 1962 Missal of Bl. John XXIII the Extraordinary Form of the Roman Rite, today is the feast of Sts. Philip and James. 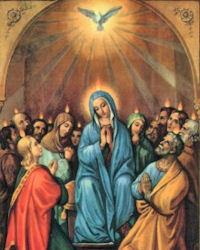 Their feast in the Ordinary Form of the Roman Rite is celebrated on May 3. St. Francis di Girolamo was the famous Jesuit pulpit orator of Naples: a volume would hardly suffice to record the wonderful effect of his eloquence. "His voice" says Butler "was loud and sonorous, . . . and the style of his preaching simple and impressive. . . . His descriptions forcible and graphic and his pathetic appeals were sure to draw tears while his energy astounded and terrified," yet there must have been much of the magnetism of the popular orator in his manner for whenever he spoke whether in the streets of Naples — a constant habit of his — or in the church great crowds followed him and not a few of the sudden conversion made by him of hardened sinners sound like the records of some modern "Revivalist" preachers. He was an earnest untiring faithful worker to the very last. Born in 1642, at a very early age he became a prefect in the "College of Nobles of the Society of Jesus" and soon after his novitiate was completed took high rank in the society. It was as a preacher and evangelist that he excelled. He died May 11th, 1716 and was beatified by Pius VII, on the feast of St. Joseph in 1806, and canonized by Gregory XVI, on Trinity Sunday 1839. Read more about St. Francis in the Catholic Encyclopedia and in Butler's Lives of the Saints.